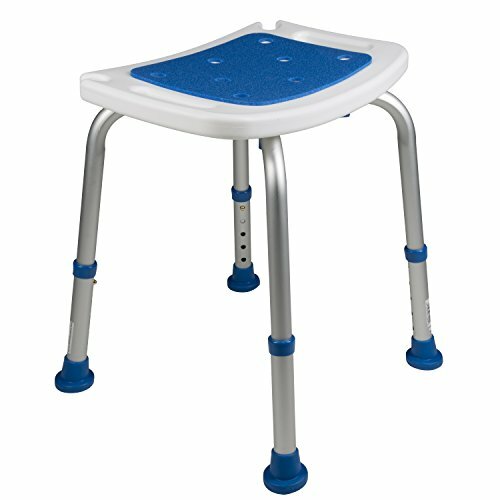 The Personal Care Products 7102 padded bath safety seat makes showering and bathing safer and more comfortable. It is very space efficient, fits almost anywhere and is completely rustproof. Features self-leveling slip-guard rubber tips for stability. Tool free installation. Adjustable seat height for true custom fit (14 to 18 inches in 1 inch increments). Molded seat with non-slip padded finish. Notched to hold hand shower. Seat dimensions: 16 inches wide, 11.5 inches deep. Product weight: 3.5 pounds. Weight capacity: 300 pounds. Drive Medical Lifestyle Bathroom Safety Quick Suction Grab Bar Rail, 23.5"